It's clear to me that there is an achievable path to sustainability. In fact, it already exists. Imagine what we could learn with 3.8 billion years of R&D. Imagine if we had 20 million companies, working on different answers, during that entire 3.8 billion years. And…imagine if they ALL had to use methods that didn't harm the ecosystem they existed in. Their manufacturing processes would evolve to continuously clean, even create the ecosystem they exist in. Enter biomimicry. We can use well adapted, sustainable solutions that exist today, in harmony with our ecosystem. With Our Earth. 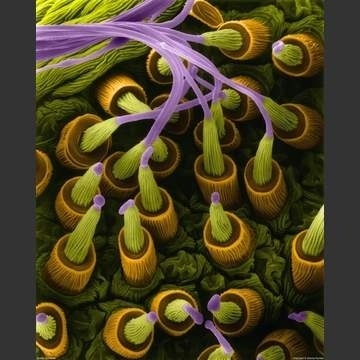 I just watched Janine Benyus share nature's designs in Biomimicry's surprising lessons from nature's engineers. Believe it or not, that's a spider's spinneret. I have heard of biomimicry before. I just hadn't really understood the far reaching applications. The sheer importance of the implications. I think this is THEE answer. Seriously. It is an achievable, existing path toward sustainability. Life doesn't kill its ecosystem while it is building what it needs to survive. Except us. So far, we have chosen an obviously, unsustainable path. Draining the finite resources at an alarming rate. Creating everything with heat, beat, and treat. Obviously, unsustainable. Check out the date. That's 8 years ago. Our President should pick one of these 12 suggestions and make it our next moon landing. Where could we take these ideas with 10 years of hyper focus, on a national scale?